15 Reasons for Sore Paws in Dogs. Why Does My Dog have Sore Paws? Why do dogs get sore paws? Sore paws matter: They are uncomfortable and can cause a dog to limp. If your dog is lame, remember a dog will be reluctant to put weight on a sore paw. Why does my dog have sore paws? Answer this question and you’re part way to getting your fur-friend back on their feet again. Poorly paws take the bounce out of Bonzo’s bungee. This article explains the common causes and how to treat sore paws in dogs. Let’s take a deeper look at that list. Would you walk around in bare feet? Nope! From sharp stones to broken glass there are hazards lying on the ground waiting to be stepped on. Unfortunately, cut pads are all too common. What is a dog paw pad injury healing time? The short answer is around 2 weeks, but it can be longer because of the anatomy of a paw pad. A pad is like a cushion. It has a spongy filling, which acts as a shock absorber. And a tough, protective outer layer. That outer is made from keratin, the same stuff fingernails are made from. Just as a broken fingernail won’t stick back together, neither does a pad. All that happens is over time the inner ‘cushion’ hardens off and stops being sore. Even a nasty looking paw pad injury flap should heal OK with time, provided it doesn’t become infected. Should I let my dog lick his cut paw? No! Dog saliva has too many bacteria in it, for the wound to benefit from the very mild antiseptic qualities of dog lick. He’s more likely to pick up an infection than heal himself. As the name suggests, Greyhound corns are an odd breed-specific quirk. They are a common cause of sore paws in greyhounds. The corns consist of a hard accumulation of extra keratin within the pad. Greyhound corns are painful and do cause lameness. Sadly, there are no easy treatments that are 100% effective. Options include filing away at the corn, apply special lotions to encourage the corn to ‘shell’ away, or surgical removal. Sadly, it’s unlikely that a Greyhound corn will disappear of its own accord. Ever heard of Athlete’s Paw? Actually, it’s not a recognized condition, but yeast infections between a dog’s toes is the canine equivalent of Athlete’s Foot in people. The yeast responsible is Malassezia (also called pittosporum). It loves warm, damp places – such as toe webbing. It causes itchiness, and when the dog licks, this provides more moisture which means the yeast thrives. Typical of a yeast infection is that the skin feels slightly greasy and the fur stained brown from licking. How can I soothe my dog’s paw? Bathing the paws twice a day with a dilute chlorhexidine solution, drying well between times, may help but see a vet if in doubt. It’s been raining for days. The fields are a greasy soup of mud and the dog is permanently dirty. The dog starts chewing at the feet and soon there’s a sore on top of the paw. This may be a case of mud rash. Mud rash is more commonly associated with horses, but it exists in a slightly different form in dogs. Mud is a rich source of bacteria. When mud stays on the skin, those bacteria can invade scratches and set up infections. What can I use on my dog’s sore paws? Keep those paws clean by rinsing and towelling dry after each walk. If things aren’t settling down, see the vet since antibiotics may be necessary. This seasonal problem can occur more easily than you suppose. Yes, pads are tough but we also let dogs play in the snow for longer than we ought. Initially, the paws may lack sensation and be intensely cold to the touch. The feet are very painful, then days later tissue dies back and sloughs away. Likewise, in the summer months, be cautious about hot pavements. If it’s too hot to hold your hand flat on a pavement slab for 5 seconds, then it’s too hot for the dog to walk on. Sometimes a simple thing can cause a big problem. Why has my dog got sore paws? The physical presence of an object, such as a large matt or an ice-ball, wedged in the fur makes for a sore paw. Be sure to check the dog’s feet daily. Keep the hair trimmed back between the toes and soak paws in warm water if ice-balls accumulate. A common summer cause of sores paws are migrating grass seeds. These seeds get tangled in the fur between the toes. Their dart-like shape then pierces the skin and they migrate beneath the surface. This causes pain and irritation, but the actual sore can be difficult to spot beneath the fur. Left untreated, the grass awn can migrate deep into the soft tissue and set up a serious infection. Prevention is best, by checking the feet (and ears) for grass seeds after every walk. But if you miss one and a blister forms on the paw, see a vet. The dog may need to be sedated to have the grass awn removed. Have you accidentally bent your finger right back? It’s excruciating. Dog’s do a similar thing with their toes when running on rough ground. If they step on a stone and it pushes the toe up, this can cause a sprain or ‘hyperextension injury’. The dog is liable to limp on the leg. But limping can have many causes and a vet will need to localize the problem to the toes. In the meantime, just as you’d rest a sprained ankle, cut back on the dog walks and have your four-legger take things easy. Pads are subjected to a lot of wear and tear. Just as people get painfully cracked and split heels, so dogs get dry, cracked pads. How do I soothe my dog’s paws? 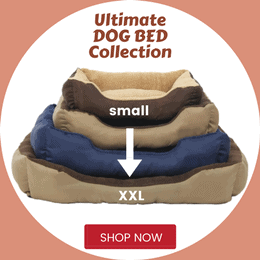 Rest your dog initially, to take the weight off the paws. Start using a paw balm (yes, they do exist!) to moisturize and encourage repair. Just as different people are allergic to different allergens, so are dogs. For some pet pals the trigger is grass sap, whilst for others it’s pollen. But the symptoms are largely the same, which is excessive itchiness and paw licking. A giveaway clue to atopy are brown paws from saliva staining. Atopy is a common problem but has a complex solution. Therapies include washing feet to remove allergens, to modern medications to control the itch. This is a life-long problem with the emphasis on control rather than cure. A dog with a food allergy may develop itchiness as one of the symptoms. Again, this leads to paw licking and those rust-coloured feet. Too much licking leads to secondary infections, which in turn leads to sore paws. 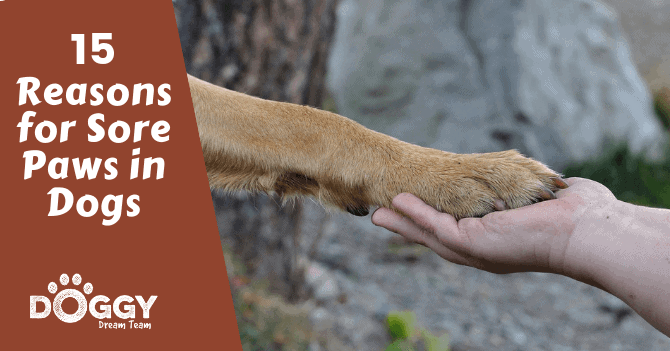 How can I soothe my dog’s paws? Key here is avoiding the food the dog is allergic to. Talk to your vet about a dietary trial and feeding a hypoallergenic diet for 8 – 12 weeks. The winter months are perilous for paws. If the dog escapes ice balls and frostbite, there’s exposure to road salt and other chemicals on the pavement. How do I treat my dog’s paws? Rinse the paws off after every walk. You could also use paw balm to provide a barrier against the elements. Some parasites have a preference for paws. A great example are hookworms. These worms thrive in wet, dirty environments. The dog walks on that ground, contaminating their paws with hookworm larvae. These larvae then burrow through the skin causing intense irritation. Other parasites with a penchant for paws include ticks, harvest mites, and demodectic mange mites. If you suspect parasitism, speak to your vet since medical treatment for that specific parasite is essential. Have you ever had a favourite pair of shoes resoled? Dog pads can also wear out. From skidding to a halt on a concrete surface to heavy exercise on a hard surface, those pads can wear through. Do dog pads heal? Yes, they do, but it takes time. Walk the dog on soft surfaces, and consider paw protector boots or bandaging their feet until things improve. A dog may lick their toes if they ache and throb, with arthritis being a classic cause. Licking with a warm tongue soothes the joints and causes a release of natural endorphins which help the dog feel good. The good news is there’s no need for the dog to be in discomfort. There are lots of options for safe, effective, pain relief – just speak to your vet. Limping is a sign there’s a problem, but it’s also quite a general symptom. Before panicking that your young Labrador has hip dysplasia…check their paws. Why does my dog have sore paws? It might be a simple cause such as a cut pad, rather than something more sinister. If the dog does have pad problems, one thing’s for sure: Work out, “Why does my dog have sore paws?” is one step closer to getting the problem sorted.